The MC-21, Russia’s advanced narrow-body airliner programme being developed by the United Aircraft Corporation (UAC), which is now part of Rostec, remains under the close supervision of the country’s government, which is also continuing to contribute sponsorship funds directly from the federal budget. The latest allocation of state funds authorised by government decree and which came into effect today (February 6), is in line with the government’s aim to support Russia’s emerging aerospace industry in the period between 2013 and 2025. 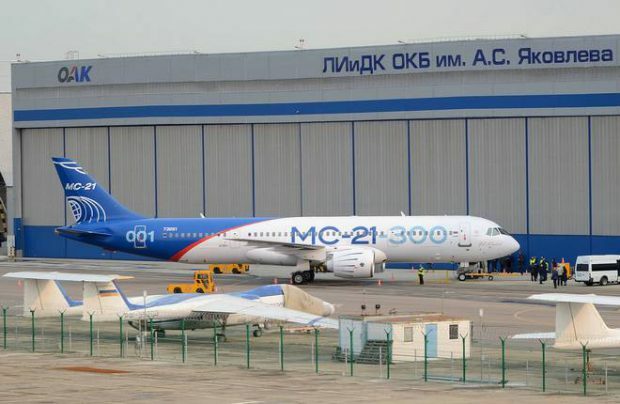 It provides for a total of 10.5 billion roubles (US$160 million) of state subsidies within the next three years for the MC-21. Prime minister Dmitry Medvedev last week summoned the country’s vice-premiers to discuss the programme’s progress. Both the latest funds allocation and the meeting took place in the knowledge that recent US anti-Russian sanctions are affecting the manufacture of composite wing and tail-fin components for the MC-21 – by UAC’s subsidiary Aerocomposit and Rostec’s Obninsk Technologiya. Hence, discussion about the replacement of foreign-made components with Russian substitutes was high on the agenda and was led by vice-prime minister Yury Borisov who promised that, by 2022, up to 97 per cent of the aircraft’s parts will be produced within Russia. “Ministry of industry and trade, jointly with the United Aircraft Corporation, have elaborated a roadmap for replacing the foreign-made components used on the aircraft with Russian-made parts,” he pointed out, emphasising that the programme will eventually be “virtually independent” of foreign-made parts. The meeting covered several other key issues, including the programme’s time-line. The launch of serial production is already underway, reported Borisov. “Production of parts and units of those MC-21-300s intended for customers is in progress and certification tests are scheduled to complete in the second half of 2020. As of today, 122 flights have been made. Everything is in line with the schedule. We have no doubts that the aircraft will enter service in its due time,” he affirmed, also pointing out that the backlog currently includes 175 firm orders, which have already been paid for. Aeroflot, the new aircraft’s launch customer, has already placed an order for 50 MC-21-300s, in a deal approved by the majority of the airline’s shareholders in the summer of 2018. With the first of these deliveries scheduled for the first quarter of 2020, there is no explanation of how a programme delay – indirectly suggested by Borisov (‘certification tests are scheduled to complete in the second half of 2020’) – may affect the national carrier’s plans.